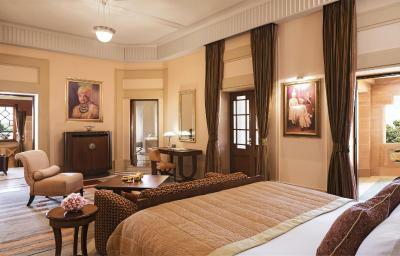 Lock in a great price for Umaid Bhawan Palace – rated 9.7 by recent guests! Stunning building overall. Our room was decorated by antique furnitures. Fruits chocolates nuts and cookies were served all the time. There’s not a single thing I disliked. We were treated with respect and civility. The little touches such as entertainment, breakfast and dinner on the terrace with live entertainment and an excellent selection of dishes. Exceptional experience. Every staff member made every effort to make our stay as enjoyable as possible. As I'm not super rich, you come in with extremely high expectations based on the price, but they were blown out of the water. If you ever wanted to feel royal, this is as close to royal you can get and is worth every cent. 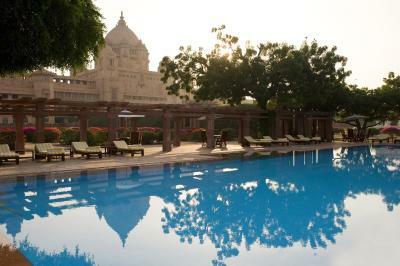 Beautiful palace, amazing facilities, wonderful breakfast, but most of all; best service I've ever received. No request is to big, they will do anything to make your stay wonderful. After check out we stayed a lil longer at the pool and still got a complementary mocktail, snackbox, fresh watermellon, home made ice cream(by Chandan), this as just one of the examples. They go far and beyond to make your stay amazing. If you have a lower budget at least try to make room for one night, it will be worth it. The more than expected place. Good food , excellent courteous staff always smiling. And the place to be whenever possible. Loved it. I liked everything about the stay. All the staff was extremely courteous, very very helpful and respectful. During my stay in India, I have stayed with Oberoi AmarVilas, Taj Lake Palace and other good hotels but I can very confidently say that my stay at Umaid Bhawan Palace was the BEST. 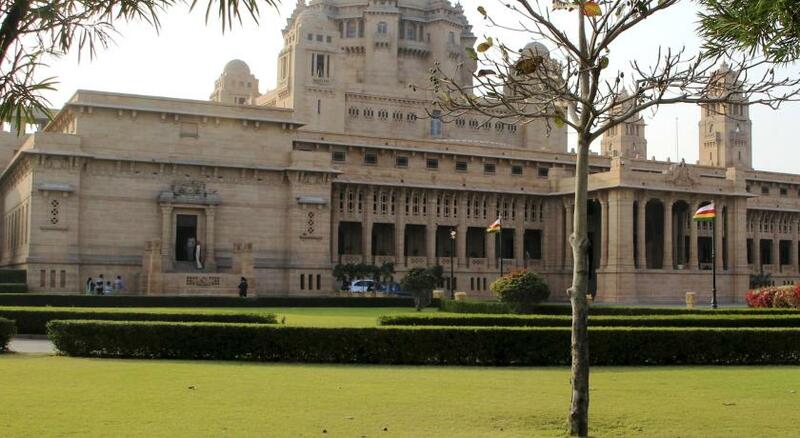 If you ever have to stay anywhere in India, I would recommend Umaid Bhawan Palace as the must stay place. You won't find a better place than this one. if anyone want to know what it is to live as a King : book this hotel and you wont be disappointed. And this not only because you will be staying in a real palace, the staff is friendly and helpfull in a way you do not find too often anymore in this world. For me this stay will remain for ever in my memory. A quiet palace on top of a hill far from the noise of cities. the full staff was xcellent. from reception to indoor dining to the lift man all served with lot of love and humility. 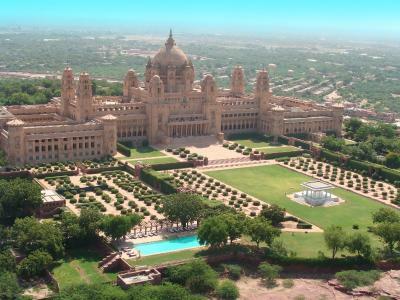 Umaid Bhawan Palace This rating is a reflection of how the property compares to the industry standard when it comes to price, facilities and services available. It's based on a self-evaluation by the property. Use this rating to help choose your stay! 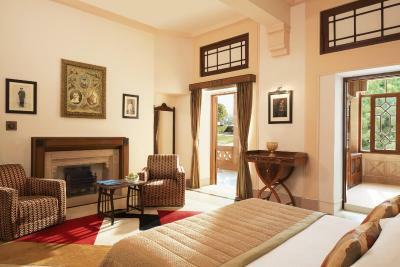 One of our top picks in Jodhpur – and a guest favorite. 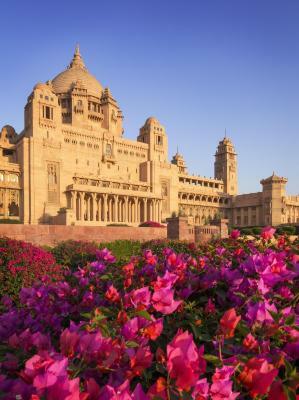 Built between 1928 and 1943, this grand yellow sandstone palace spreads over 26 acres of gardens, making it one of the largest private residences in the world. 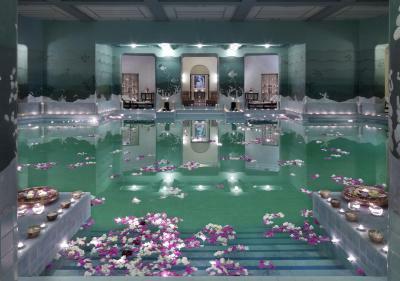 Featuring Art Deco and Renaissance design, it has 2 swimming pools and pampering treatments at Jiva Grande Spa. Spacious air-conditioned rooms and suites were designed for royalty, all equipped with a flat-screen TV, DVD player and spa bath treatments. 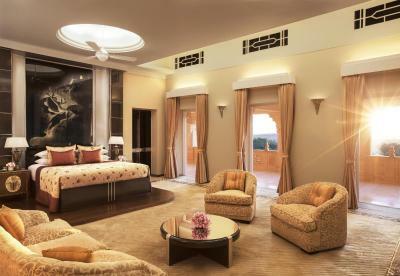 A pillow menu, well-equipped mini-bar and Molton Brown toiletries are included. All bathrooms have a bathtub. 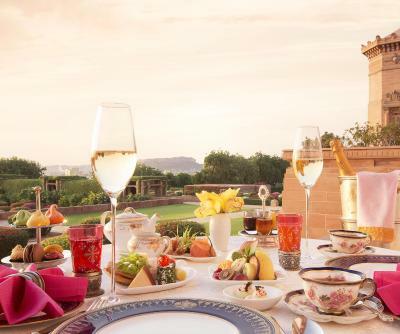 Umaid Bhawan Palace overlooks the desert capital of Jodhpur, a 15-minute drive from Jodhpur Airport and 1.5 mi from Jodhpur Railway Station. 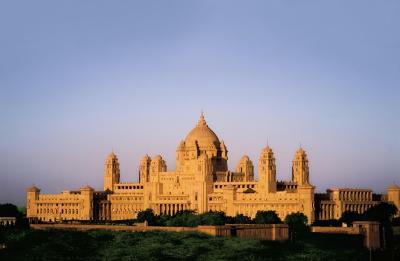 Attractions like Clock Tower Market, Mehrangarh Fort and Jaswant Thada monument are within 5.6 mi away. The unique Champagne Museum Walk invites guests to admire the fine collection of Victorian and Edwardian antiques with a glass of champagne in hand. 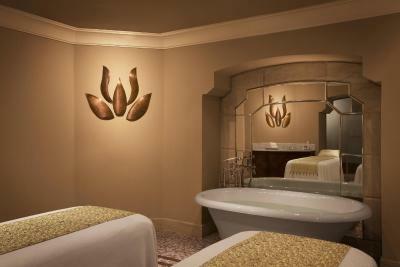 Jiva Spa offers traditional Indian beauty therapies, as well as hot tubs and steam rooms. For the health conscious, a yoga studio, gym and tennis courts are provided. 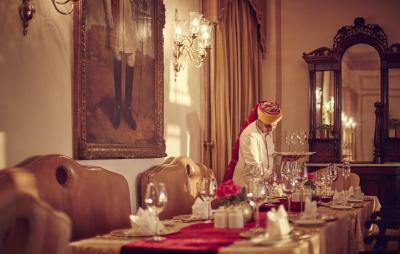 Risala serves Continental and Indian fusion cuisine, while Pillars serves Rajasthani meals. Drinks can be enjoyed at The Trophy Bar. 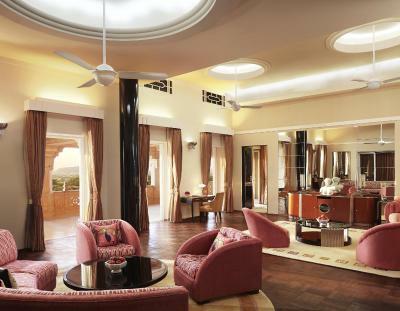 This property also has one of the top-rated locations in Jodhpur! Guests are happier about it compared to other properties in the area. 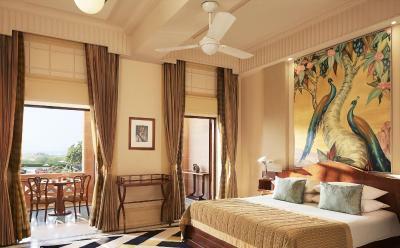 This property is also rated for the best value in Jodhpur! Guests are getting more for their money when compared to other properties in this city. 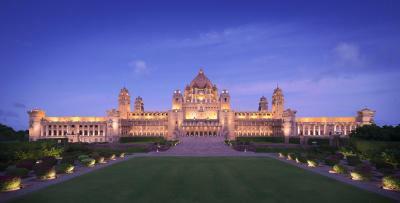 When would you like to stay at Umaid Bhawan Palace? 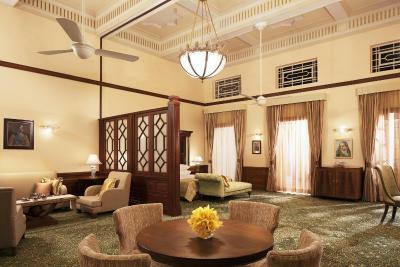 Featuring Art Deco design, air-conditioned rooms all come with a 32-inch flat-screen TV and DVD player. 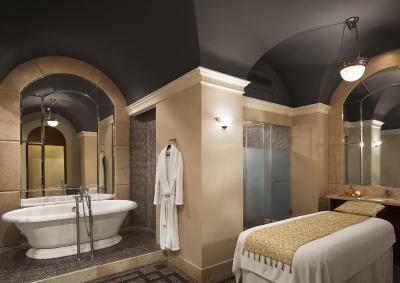 A pillow menu, luxurious Molton Brown toiletries and relaxing spa bath menus are included. Tastefully designed in different color schemes, these luxurious suites feature private outdoor seating with views of the lawns and courtyards. Includes a 33-inch flat-screen TV, DVD player and relaxing spa bath menus. 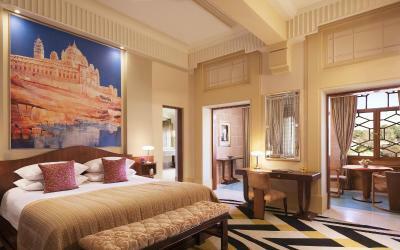 Luxurious Art Deco-style suite comes with sweeping views of Baradari Lawns and Mehrangarh Fort. Includes a 42-inch flat-screen TV, DVD player and a private bar. Relaxing spa bath menus are included. Uniquely designed in a grand elegant style, spacious suites feature a 42-inch flat-screen TV, DVD player and a dining area. Large bathrooms have Molton Brown toiletries and a relaxing spa bath menu. 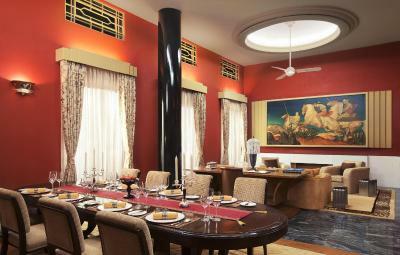 The last of the great palaces of India, the property houses a family museum, as well as the resplendent Umaid Bhawan Palace. 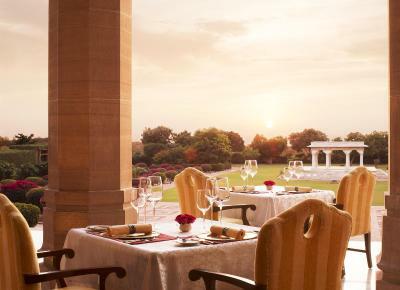 Set amidst 26 acres of lush gardens, with dancing peacocks and a subterranean Zodiac Pool, the luxury five-star Taj heritage hotel offers 64 utterly breathtaking Art Deco- style rooms and suites. 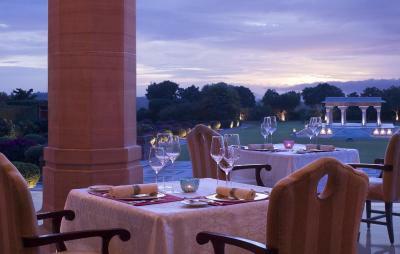 Tantalise your taste buds at Risala with authentic Rajasthani and Indian cuisine. 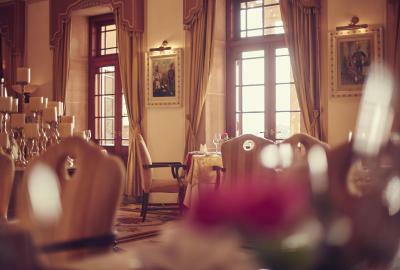 Discover an array of European and Mediterranean delicacies at Pillars, set in a lovely colonnaded veranda. Unwind at the Trophy Bar with its unique hunting-themed décor and vast selection of alcoholic beverages and cigars. 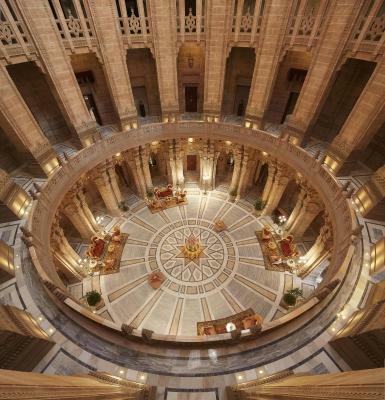 House Rules Umaid Bhawan Palace takes special requests – add in the next step! 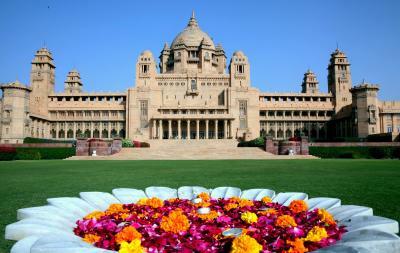 Umaid Bhawan Palace accepts these cards and reserves the right to temporarily hold an amount prior to arrival. Please note that for security purpose all Indian guests are required to present a valid photo ID proof (Voter's ID, Driving License, Aadhar Card, any other ID with address approved by the Government of India. A Pan Card is not acceptable). All international guests are required to present a valid passport and visa. For Indian guests, cash settlements of INR 50000 and above will require a pan card copy during check out. 24th Dec 2018 - INR 7500 for an adult and INR 3750 for a child. 31st Dec 2018 - INR 37500 for an adult and INR 18750 for a child at Mehrangarh Fort. The Palace Collection shop at the Hotel was overpriced, I saw the EXACT set which was selling at INR 17500 in Umaid Bhawan Palace shop, which was selling for INR 10900 in Mehrangarh Fort souvenir shop. 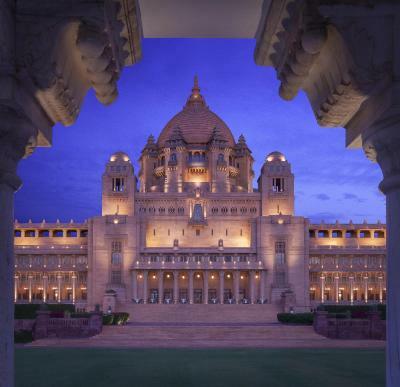 I told the Umaid Bhawan palace shop about it and I said if they can match the price I will take it but they were not interested. After dinner , we had stomachache and vomiting. We got good poisoning. three of us sick ate the chicken. The indoor swimming pool shower was in a sorry state. Willingness of staff to go the extra mile. Nothing to dislike. 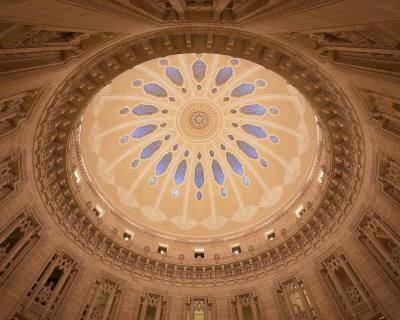 Every aspect was attended to with detail to completion. 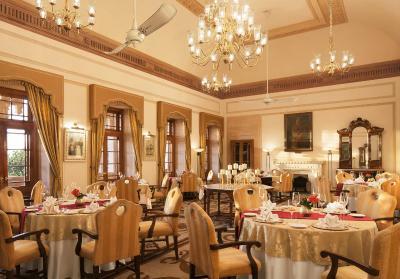 EVERYTHING ABOUT UMAID BHAWAN IS GRAND, FROM THE GRAND WELCOME TO THE COURTESY OF THE STAFF, ELEGANT DECOR, FOOD WAS DELICIOUS, CLOSE TO NATURE. WORDS CANNOT EXPLAIN THE EXPERIENCE. 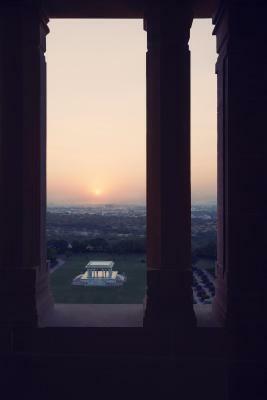 ONE HAS TO VISIT IN ONCE LIFETIME TO HAVE AN EXPERIENCE OF LIFETIME AT UMAID BHAWAN.